I spent an unforgettable two weeks in Franschhoek in mid March. It was impressive to see some of the work that has been inspired by Project Spark. Sally and Spark have made an incalculable difference to the lives of very many children and adults. Sally had very kindly taken time off during my visit in order to take a much needed holiday. But we spent a couple of days visiting Project Spark's undertakings. West End Primary School is on the edge of a very rich area and she took me there first to see the vegetable garden. I understand that this school is the poorest of the four schools in which Project Spark is involved. I was struck by the way faces lit up when "Miss Sally" appeared! The veg. garden is on a slightly higher ground than the dilapidated school and it is obviously loved and cared for by the small children. Then we inspected the toilet, where the toilet bowl is now very visible through a hole in the outside wall! Sally informed me that in one school she and the Headmaster had had to teach the kids how to use the toilets. They originally thought they were for washing hands and faces! The following day, we went up to Groendal, the enormous and hidden away coloured area, where Sally lived for eighteen months as the only white person in residence. At the bottom of the hill is the Jireh Vegetable Garden. The garden covers an area the size of a football pitch. It is beautifully kept and cared for. Dave is in charge. He had been on the streets when Spark discovered him and provided him with a home and a livelihood. Dave, his wife, daughter and granddaughter live in a small hut on the premises supplied by Spark. Sally told Dave in no uncertain terms, that he was be sure to keep off the drink - otherwise he would not be allowed to remain as caretaker. Dave assured her - with a big grin - that he would not dream of going back on the drink! The garden provides food for the soup runs and for the local hospice; this enables medical/palliative care to be provided at home rather than in a residential situation. The veg. garden enables fresh food to be provided as part of the care package for the sick and terminally ill.
We then went up the hill to a new school at the top of Groendal, Dhalabushli. The little veg. gardens there are cared for and loved. It is obvious that the children take great pride in having their own place to grow vegetables. But not all was well - Sally observed that the irrigation system she had installed, was now diverted to a building site for a pre-prep school. To be sorted !!!!! We walked through the black area which is at the top of Groendal and extremely poor. Sally is obviously accepted there and has performed some unusual errands, from helping deliver a baby to supplying emergency aid to the very sick. The so-called coloured area is further down the hill towards Franschhoek. It is more prosperous than the black area - but there is no comparison between anything in Groendal and the comforts of Franschhoek.There is only one place from which Groendal is visible to 'outsiders': a fleeting glimpse from the Paarl/Franschhoek road. Then Groendal 'disappears' again. The next school we visited was in Simondium. Another veg. garden doing well - but lo and behold, there were four windowless shipping containers parked on the premises. How had they arrived there? Four families in them; the containers roasting like ovens in the summer, and miserably dark and freezing in the winter. They had not been there when Sally had last visited, but she takes the view that the people need help. If the veg. garden is providing them with help, then so be it. 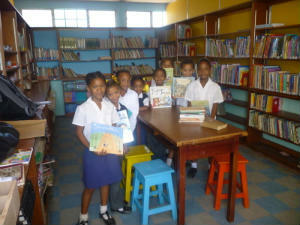 In the afternoon, we visited Wemmershhoek Primary School and met Jacquie, who has set up the library there with Sally. This school is for the children of farm workers - black kids and coloured kids. The library is regarded as an off site unit (The restriction on primary school children learning English means that libraries, which include English books, have to be off site. They are used out of school hours, rather than during lesson times). 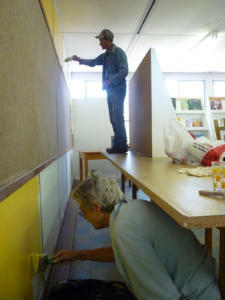 Sally and Jacquie have done a wonderful job of getting the library into shape, painting and refurbishing the room, cataloguing an impressive choice of books in Zulu, Xhosa,Afrikaans and English ( books in English provided by schools in North Oxfordshire. Sally carries them over in her suitcases). When the library started, Sally and Jacquie had been faced with boxes of donated books - suitable and unsuitable; a mass of drab tables, damaged stools and endless boxes. Rain was coming through the roof! There was no order and Jacquie and Sally have been ingenious in creating a warm and welcoming library on a very limited budget. When we departed, there was a queue of kids waiting to get in! This is a 'taster' of all that Project Spark has created and enabled in and around the Franschhoek area. One of the strengths of Spark is the fact that Sally can move fast when serious needs become apparent. 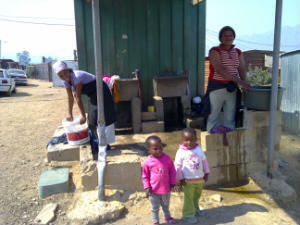 For instance, nine shacks were burnt down in Groendal in January, leaving nine families with NOTHING. Sally and Spark have now set up an emergency fund for such situations. 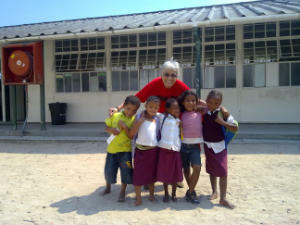 Children can be immediately supplied with new school uniforms, with clothing and bedding. Families can be supplied with essential equipment for washing and cooking. Sally believes that prevention is better than cure. She is now in discussion with the Stellenbosch Municipal Fire Brigade with a view to training up local men from the shanty town. Not only will this provide employment but will hopefully ensure that trained men will be on hand in the shanty town to deal with the disastrous fires which break out every year. I was privileged to be allowed to see a small part of this outstanding work. 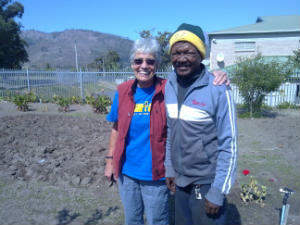 Sally and Dave the caretaker of the Jireh project, life in a shanty-town, the finished school library and Sally and the school caretaker painting the library.